Our High-Flying Guide to the Greatest Finds in O.C. Your table of contents for what made it from pages to megabytes. For the full print or digital edition, get a copy on newsstands or in the iTunes store today. 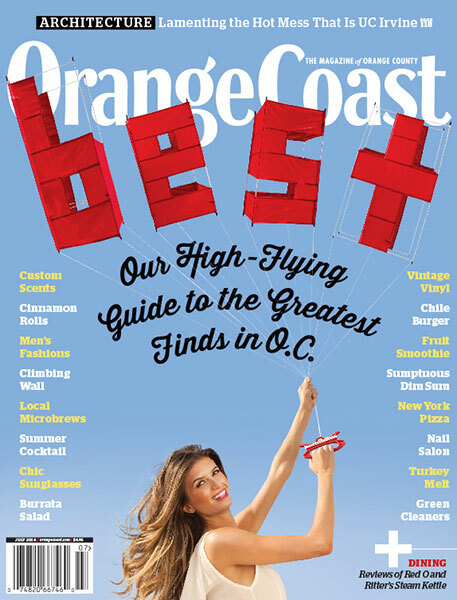 From 20 glorious print pages of our annual salute to Orange County’s finest products, services, and attractions, we present a daily stream of “Best Of” posts at orangecoast.com/guides—check back (or on our social feeds) every day for the latest. Click here for tickets to our first-ever “Best of” party on July 17! Southern California cultural institutions such as UC Irvine and LACMA are busily erasing the midcentury legacy of architect and designer William Pereira. Periera’s work has been misunderstood, his iconic concepts unappreciated. Today, with the late designer finally on the verge of being rediscovered as a major Southern California architect, will enough of his buildings remain to be enjoyed? Click here to read our story. Web Exclusives: Click here to read “How Pereira Got the Job to Design Irvine and UC Irvine” and click here to watch a “Planet of the Apes” clip with UCI as the backdrop. Cypress native Andy Tubbs has traveled the globe to compete in adventure racing, a challenging multiday sport in which teams often forgo sleep to run, cycle, and paddle to the finish line. Tubbs’ team placed ninth at the world championships last year, but this year he’s being tested even before the competition begins. Click here to read our story. Check out our Main Course review on Rick Bayless’ Red O in Newport Beach. We scope out Ritter’s Steam Kettle Cooking in Second Course, and click here to find O.C.’s Best shave ice, that summertime staple. In Global Diner, we reel in O.C.’s favorite fish taco. Don’t forget to click over to our Dining Guide, our authoritative and searchable listings of more than 180 recommended Orange County restaurants. Find out some Trade Secrets, as in, how O.C. homeboy Mike Walters, the news director at TMZ, got the Donald Sterling scoop, and other things. Plan your summer Perfect Getaway to nearby Santa Barbara. Explore the new Anaheim’s Packing House in Buena Park, plus all our Neighborhoods here. The always-entertaining O.C. Answer Man is available here. And shop this month’s Hot Shop, Petals & Pop in Seal Beach. Zoom! Society editor Gloria Zigner and contributing editor Maxine Loder recap the county’s top charity events. Be sure to review our Charitable Events calendar here. Don’t Miss! Six events you’ve gotta check out this month. Rituals Even people who supposedly want the hoi polloi out of their backyards support keeping O.C.’s iconic beach fire pits!